Drove north along single track coast road to Bunavullin. I want to start a walk here investigate the eviction village of Auliston. My first problem was finding somewhere to park. The road was single track for over 10miles and some of the passing places were an extremely long way apart. The end of the road is an area of grass by the shore with a slipway, small building and sign saying 'ferry' There is also a sign saying turning space, private and no parking. Just before the 'end of road' sign was a small stoned area next to the road with just enough room to fit my car, so that's where I left it. I walked back along the road for a while then headed up an estate track through the trees. There were several houses around but this was all private estate territory. Before reaching Drimnin House there was a right branch to the track which I followed higher up the hill. 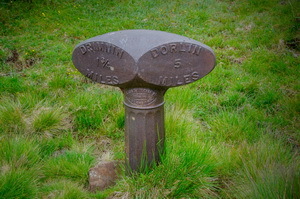 On the right of the track was a cast iron milepost saying Drimnin ¾ mile Dorlin 6 miles and exactly the same design and iron founder as those across Mull. The founder Smith, Patterson and Co of Pioneer Foundry, Blaydon-on-Tyne. Apparently they existed between 1870 and 1954. 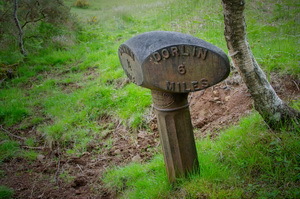 The track was improved in the 1880s as a poor relief road and the posts probably date from then. 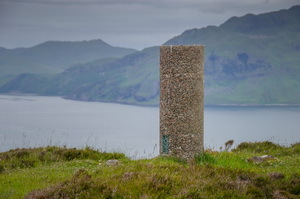 I left the track for a while to climb up Cnoc na Staing to visit the trig post. It is one of the cylindrical concrete type. Its altitude is 136m and not on the highest point. 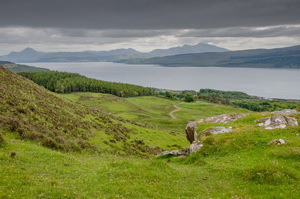 Considering the overcast and dull weather the views across to Tobermory were picturesque. I descended steeply down back to the track where I came across another iron milepost with the same design as the previous. At a culver under the track I turned left to follow a faint track across a field and through a gate. Down a gently sloping grassy ridge I came to the ruins of Aulston. 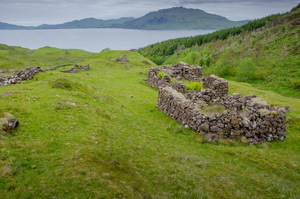 This is a group of ruined croft buildings of the traditional design of a rectangular stone wall and thatched roof. The walls were mostly in tact and many at the original height. 115 people lived here in 1851. When the village clearances continued some occupants (6 families) from Aulston were evicted to Dorlin. Subsequently in 1868 they were evicted again to permit large scale sheep rearing. 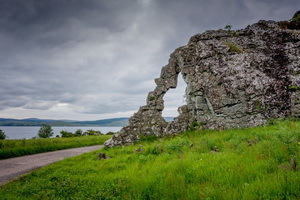 I descended past the ruins towards the sea where there were more ruins. I didn't go right down but turned to my left to follow around to head back south above the rocky shore. 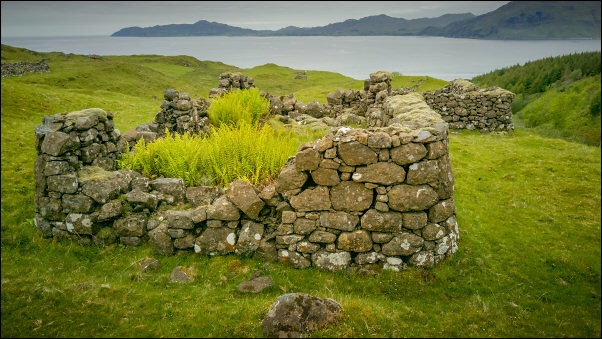 The map shows an ancient fort by the shore at Eilean Uillne. I scoured the area through my binoculars but couldn't see any sign of its remains. Eventually I came to a muddy track which passed through some very boggy ground. Through a gate and ford the track passed the occupied buildings of Mains of Drimnin. The track went round the buildings and continued. By some trees I climbed above the track to investigate a point on the map describes as a tomb. It was a fenced of area with a gravestone inside. 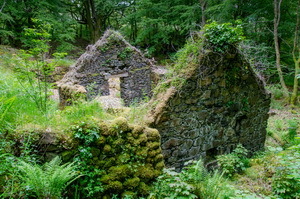 It was quite dilapidated now and in need of some tidying up. Back on the track I continued towards St Columba's Chapel. It was interesting approach through the trees with the church appearing round a bent. It had an unusual square tower. 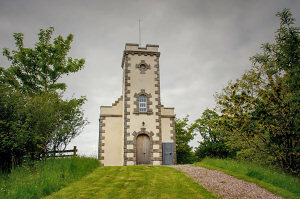 It was originally built in 1838 and restored between 2008 and 2012. 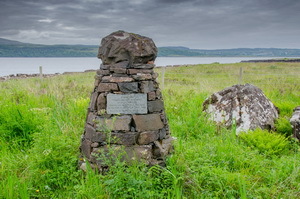 To remember Charles Maclean of Drimnin Killed 16th April 1746 leading thee Macleans at Culloden in the forced absence of their chief. I drove back south and stopped briefly to investigate the volcanic igneous intrusion that is called Clach na Criche which means Boundary Stone in Gaelic. 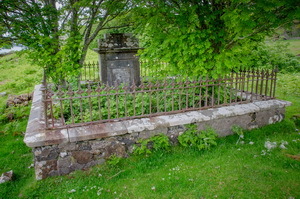 Funeral processions rested here as they passed from Lochaline to Drimnin.